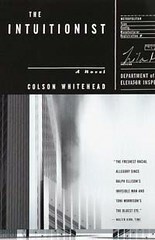 “The Intuitionist”, Colson Whitehead’s first published book, is a very interesting blend of genres from ‘noir’ detective stories to science fiction. It has been compared by several reviewers to Ralph Ellison’s “The Invisible Man” and Toni Morrison’s “The Bluest Eye” for the way he looks at and writes about race, one of the main themes of this book. The others include gender, man’s reliance on machines and the battle of reason over instinct. While the book seems to be easily read, it contains layers and layers of subtext that address many different issues. Set in an alternate New York City, the story follows a young black woman, Lila May Watson, the first black woman in the prestigious elevator inspectors guild, as she investigates what she believes to be the sabotage of her most prestigious elevator assignment. This case is made more interesting by the fact that she is an Intuitionist, a member of a controversial faction of the guild who intuitively detect the faults with an elevator instead of manually examining the equipment. The Intuitionists have a higher success rate than the Empiricists, who do things the old way. In the guild, Empiricists are the conservative old guard while Intuitionists are the liberals. Therefore, the fact that the only black female guild member is an Intuitionist with a perfect record works in their favor. Since this is an election year in the guild, with Chancre, the current president and an Empiricist, in serious danger of losing, the Empiricists aren’t too sad about the failure of the elevator she inspected. In the process of her investigation, however she becomes aware of the existence of the ‘black box’, the perfect elevator designed by the founder of empiricism before his death and she becomes determined to find the plans for the black box before anyone else does. The main characters in this world are all very complex and have several layers to their character and their actions. A good example of this is Pompey, the only other black person in the department and the first black elevator repairman ever. From the beginning we are made aware both of Pompey’s hostility towards Lila May and his subservience to his white coworkers and superiors. This makes it easy to simply see him as an ‘uncle tom’ and move on and this is what Lila May originally does, going as far as to make him the prime suspect in the sabotage of her elevator, thinking that the Empiricists would find it funny to have one of the only two black people in the guild sabotage the other. However, she realizes that in resenting him back, she just furthers the status quo. We also find out what his true motivation is for laughing at racist jokes and sitting through minstrel shows pretending to be amused. He considers it a worthwhile sacrifice to move his family into a better neighborhood away from the crime in his. His frustration with her is partially directed at himself. He feels she should be grateful to him for the sacrifices he made to allow more black people in and at the same time he hates her for not serving them the way he does and thus calling into question his life choices. Lila May is herself a very complex character. Unlike Pompey, she does not become a ‘pet’ black person in order to advance. What she does instead is to make herself into an almost emotionless machine. Her work record is spotless, she is always immaculately dressed and she is polite to a fault but she does only what is required of her, socializing with only one other inspector and living in a spartan apartment with no luxuries. She suffers from the double disadvantage of being black and a woman in a highly conservative world. Most of the black people we are shown are menial labourers while most of the women are either working or entertaining men. In order to be neither of these, she is willing to settle for being an invisible, highly efficient worker. Another character I enjoyed exploring was James Fulton, the deceased inventor of Intuitionism and the ‘black box’ which everyone seems to me looking for. Among Intuitionists and elevator inspectors in general, he is revered as a visionary however they remain unaware of the fact that Fulton was in fact a black man. Fulton’s mother was raped by a member of the white family whose house she cleaned and he grew up around black people before ‘passing’ in order to become an elevator inspector. His original idea in creating Intuitionism was as a joke that liberal members of the guild picked up as a truth. Later, it became a way to get people to think about looking beyond appearances at the soul of a person instead of at their skin. Unsurprisingly the first person to realize this is Lila May when she reads his books on Intuitionism after discovering that he was writing as a black person. What makes Fulton interesting is his way of fighting the system. Unlike Pompey who simply gives in or Lila May who accepts her role as an outsider, he chooses to poke fun at the system from within it and slowly change its ideology to one that is more racially tolerant. Another interesting thing Whitehead does is contrast white liberal and conservative groups, as represented by the Intuitionists and Empiricists, in their treatment of black people. In his eyes, they all appear lacking. The Empiricists are generally more open in their dislike of black people. At several points in the book, they are open in their dislike of Lila May and call her and other black workers niggers to their faces. In a Party for Elevator inspectors organized by Chancre, a minstrel show receives the most enthusiastic response from the audience. The Intuitionists, on the other hand, seem more friendly to black people. They give Lila May an inspecting position in the most prominent new building in the city, which just happened to be named after a black actress and they appear to be very helpful in her search for the ‘black box’. However, they also use her shamelessly as part of their election campaign to show how liberal they are, as if the fact that the only black female elevator inspector is also an Intuitionist makes them better than the Empiricists. Their ‘help’ also turns out to be little more than manipulation because Fulton’s memoirs mention her name. In reality, they care about her about as much as the Empiricists but are more subtle about their prejudices. Ultimately, she has no one to depend on but herself. Colson Whitehead’s book, is an incredible achievement, especially since it is one of his first written works. It it is easy to see how comparisons were made to Ralph Ellison and Tini Morrison’s masterpieces. It presents a series of incredibly interesting yet human characters with believable flaws and uses them to examine a whole myriad of issues in a very intelligent way. I will be very interested to see what he comes out with next.